Remember when the cold air left and our legs victoriously broke free from the confines of denim and leggings?! It all felt so exciting and scandalous. Fast forward a few months and we’re hot, bored with the once exciting patterned shorts we’ve now worn one too many times, and would gladly welcome a chilly breeze signaling sweater season. But alas, it’s only August and in the South we still have a while before we can break out the sweaters we’ve been wistfully stocking up on (like this, this and this!) So until then, here are 5 ways (and pieces) to get you through in style! 1. 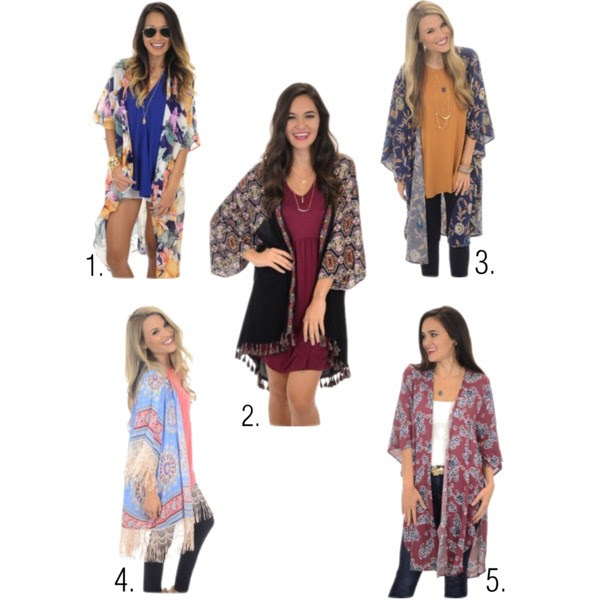 A great way to switch things up and make your go-to tanks and dresses interesting again is to top them off with a fresh kimono! 2. Accessorize, accessorize, ACCESSORIZE!! A statement necklace or earrings can make many pieces in your wardrobe feel brand new. 3. A statement bralette peeking out totally revamps your look and gives it the perfect touch of feminine edge. 4. If you’re like us, you’ve been wearing the same pairs or jean shorts and chinos all summer long. Swap them for some breezy pants for a completely different look! 5. Invest in a maxi dress you love! The maxi is every stylish girls secret weapon. Opt for a solid color or basic pattern so you can mix up the look with accessories and take it into fall under jackets and cardis!